The big day has finally arrived when you get to bring your Beaglier home, but being prepared will take much of the anxiety away from his arrival. There are a few basic essentials to have at home for your puppy’s arrival. These are his food, bed and toys. While these are the basic essentials, there are a range of products that will make the transition much easier. These essentials will provide for your puppy’s health requirements. It’s much better to buy these supplies after speaking to the seller so that they can advise you on what your puppy is already eating as well as what they would recommend. They will also have experience with the brands and models of equipment that they use and will be a helpful resource if you need to ask questions later on. If you are going through a business, they may also have the right products available to buy and collect with your puppy and be able to guide you in their proper use. It cannot be stressed highly enough, that your puppy remains on the same diet that they are already being fed. If it is necessary to change the diet, this must be done very gradually over time. Sudden changes in diet can, and often will, cause severe gastrointestinal upsets in your puppy that can be life-threatening. Your puppy needs to be fed a premium diet for optimal nutrition during their most important puppy stage. Feeding your new puppy a cheap, supermarket brand of dry food with low nutritional content will not meet the needs of a growing puppy. If the breeder or seller is not feeding a premium food, ask why not. If the breeder sites price, cost restraints or another unsubstantial reason, you may be better off sourcing your puppy elsewhere. Reputable sellers want to give their dogs the best possible start. Skimping on quality of nutrition to save a few dollars is not in the best interest of your puppy, nor is it best practice. Water and food bowls are also required and your Beaglier needs to have a separate non-tip bowl for each that are made specifically for dogs. Do not allow your Beaglier to eat from your own bowls. Bowls and dishes made for human use are usually too fragile for excited dogs and broken bowls can injure your puppy. This will also help to prevent your dog associating your bowls with her food. Another important tip, is to never allow them to eat from the table. Also make sure that your Beaglier has clean fresh water available at all times. A water bowl that is large enough water they consume in a day while being shallow enough to prevent drowning is ideal. 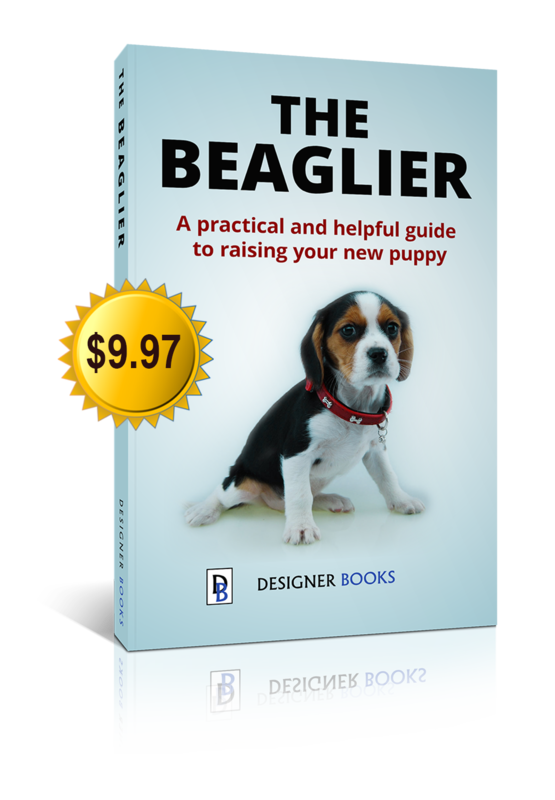 Your Beaglier will need somewhere of his own to sleep as sleeping in your bed can be dangerous for a small puppy. Whether you choose a bed or crate is up to you but it needs to be placed in a warm and quiet place to help your puppy feel secure and comfortable. Puppies need a place that allows them to sleep without being disturbed whenever they wish to rest. You can section off an area around her bed for a few days using a puppy plan pen as her safe area. This way, she can be inside the house when you cannot supervise her to keep her out of trouble. Your puppy is better off being in a smaller area where they are safe, rather than being given the run of the house at the risk of injuring themselves. Dog toys are probably the most fun items to purchase for your new dog but not all dog toys are safe for all dogs. Toys that are safe for a toy breed, such as a Chihuahua, can be a choking hazard for a larger breed such as a Beaglier or Puggle. Most commercially manufactured dog toys will state the size of dog that they are suitable for, but use your own judgement as well. Remember you can always ask the breeder or seller what toys they prefer to offer their Beagliers and what the dogs actually like to play with. There are wide range of toys available these days, to keep your Beaglier entertained and stimulated, so have a few already at home waiting for the arrival of your new dog. Large, chunky, raw beef bones are one of the best toys a Beaglier can play with. These are the toys of the natural world, and for a food-driven breed such as Beagliers, can offer hours of entertainment and mental stimulation. Just be sure that the bones are changed after a few hours to keep them from going off. You can give your puppy its first bath in the first few days of bringing them home, but always use a puppy shampoo and warm water to make it an enjoyable experience. Also make sure the water level low enough to allow your dog to keep it’s face above the water while they are standing with all four feet on the bottom of the bath. Having another adult help to hold your dog while you bath them for the first few times is recommended until they learn to like bath time and you become more confident. Although Beagliers have a short coat with minimal grooming requirements, their coats will benefit from a brush. Get your new dog used to being brushed using a soft brush for short periods of time – under 5 minutes – when the house is quiet and they are nestled in your lap. This will help your Beaglier associate the brush with being patted and make grooming much easier. Offering rewards such as treats, for good behaviour during both bathing and brushing will reinforce their mental association between these activities and pleasurable experiences. These are just the basics to have on hand for the arrival of your new puppy but there are a number of other products that can help make the transition to your home easier for your puppy. Remember to ask about other useful products and helpful advice when picking up your Beaglier.